Once again, Circuit de Barcelona-Catalunya will be hosting all eight days of pre-season Formula 1 testing for the 2019 F1 season. Here’s everything you need to know about going to Barcelona for the winter tests ahead of the new season. Circuit de Catalunya-Barcelona will host all eight pre-season testing days for 2019, which are held in a two-week period beginning on February 18 and ending on March 1, less than two weeks before the season kicks off in Australia. Tickets are really cheap and you’ve got the circuit to yourself, with few other spectators in the grandstands. VIP tickets (above the pits) are not nearly as expensive as at a full race weekend. You can also take advantage of some special access, which is not normally available at a race weekend. New for 2019, it’s possible to purchase Paddock Access, which costs €99 per day and includes General Admission access to the circuit. You can also take a guided tour of the circuit for €50, also including General Admission access for the day. For the same price, you can also get access to the pit lane walk, pit roof terrace and a ride on the circuit go-karts. We expect these special offers to sell out quickly, as availability is limited. 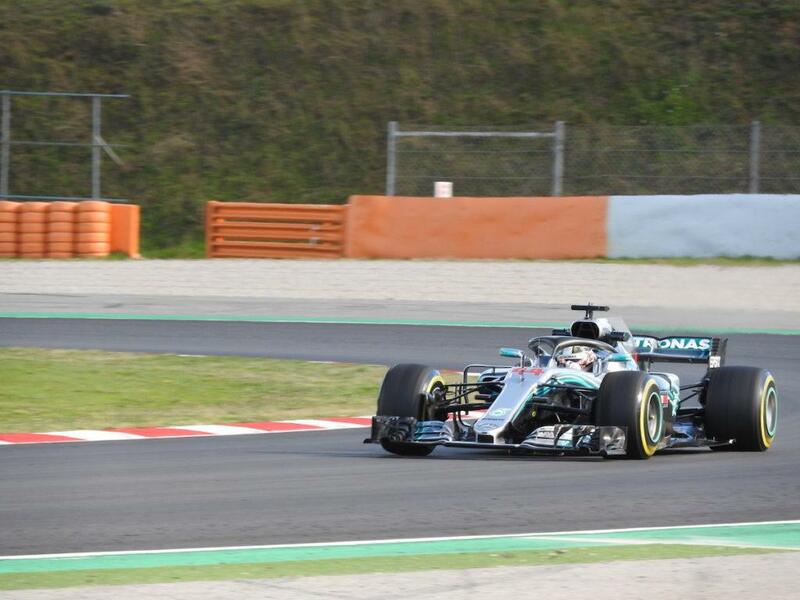 Join our closed Facebook group Going to pre-season F1 testing in Barcelona to connect with fellow fans, ask advice and plan joint trips to the circuit! What tickets are available for 2019 winter testing at Circuit de Barcelona-Catalunya? All ticket prices above are for one day of access. 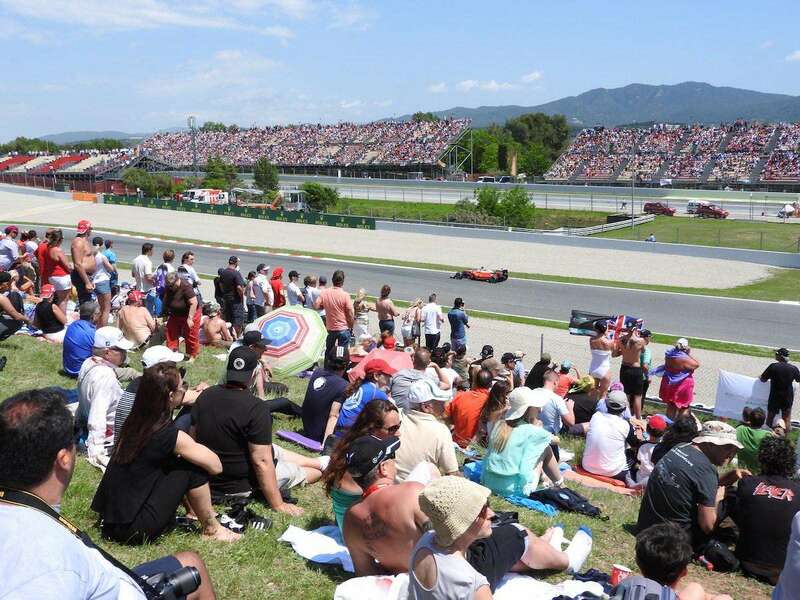 Buy advance 3-day or Sunday tickets to the 2019 Spanish Grand Prix on May 10-12) and you will be granted FREE General Admission entry to the test days. 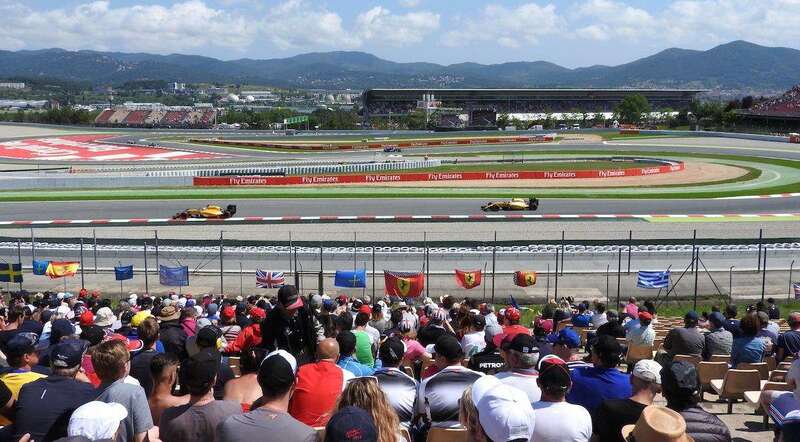 Check out our guide on buying tickets to the Spanish Grand Prix, which includes videos and pictures showing you the views from all the grandstands and general admission areas at Circuit de Barcelona-Catalunya. The teams and media generally book the best hotels close to the track, meaning you could have some interesting guests in the breakfast room if you stay near Montmeló. Further afield, the beautiful city of Barcelona is only 30km away and it’s not too difficult to take a train to the circuit (our advice on Getting Around at the Spanish Grand Prix is also valid for testing.) Another option is to hire a car and stay in one of the coastal towns on the nearby Costa Brava such as Montgat or Lloret del Mar. They will be quiet at this time of year, but still pleasant. It’s best to fly into Ryanair’s hub at nearby Girona airport if you choose to stay on the Costa Brava and hire a car. There’s a good network of motorways in the region and traffic should be light if you avoid Barcelona; just don’t forget to take a GPS or have navigation available on your smartphone. PLEASE NOTE: the second week of testing in 2019 coincides with Mobile World Congress Barcelona (February 25-28), a large trade event that draws thousands of participants to the city. Accommodation in Barcelona is likely to be more expensive during this week. It’s called testing for a reason. Not all the new cars will be fast or reliable out of the box, not all the big-name drivers will be there every day and not much of the on-track action will be ‘on-the-limit’. None of this will stop us returning in 2018….! Gates open each day at 08:30. Enter via Gate 3 behind the main grandstand; all other gates are closed for entry, though you can leave by Gate 1 behind Grandstand G at the end of the day. The cars will be on track from 09:00-13:00 and 14:00-18:00 each day. The following grandstands will be open: Main grandstand (top and bottom tiers), F Grandstand on first corner and G Grandstand. Check the grandstand map. Spain is starting to get warmer in March, with daytime temperatures in Barcelona averaging around 16 °C (61 °F). Realistically though, you can expect anything from snow and rain to warm sunny weather, so be prepared. Read our detailed travel guide to the Spanish Grand Prix for advice on traveling to Barcelona and getting the most out of your stay. We will be updating the guide for 2018 in the coming months. Been to Formula 1 testing in Barcelona? Leave a comment below with your tips! Going to testing? Join our closed Facebook group to connect with fellow fans, ask advice and share trips to the circuit! History, facts and background of the Spanish Formula 1 Grand Prix at the Circuit de Catalunya outside Barcelona. The next race is on May 9-12, 2019. Useful travel information to help you plan your trip to the Spanish F1 Grand Prix in Barcelona. The next race takes place on May 9-12, 2019. 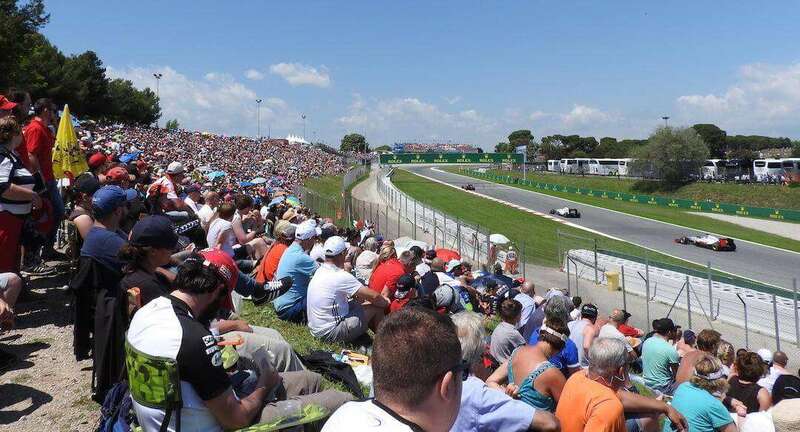 Advice on flights to Barcelona for the Spanish F1 Grand Prix, getting around in the city and information on how to get to Circuit de Barcelona-Catalunya. 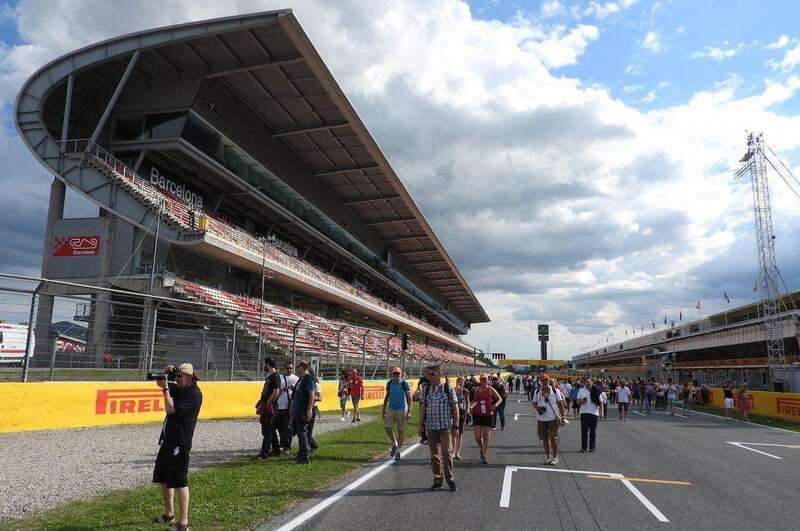 A selection of the best-rated accommodation in Barcelona for F1 fans going to the Spanish Grand Prix at Circuit de Catalunya. Do you know if the alcohol ban in the F1 event is going to be still effective this year in Barcelona? Yes, I believe that this will continue. Sorry about that! But there are bars just outside the gates where you can get real beer. You can leave and return for a pitstop! Do you know if you can take your camera to the testing? Sure, why not! You may have to be careful if your kit is very professional, but I don’t imagine the bag checks will be too detailed. Hi, there will be food kiosks around the circuit during the test days? Hi Paolo, I am not sure that many food kiosks will be open, probably just a couple behind the main grandstand. Of course they are expensive as well. We will be taking our own food and drink! Can you walk around the whole track or are you penned into a specific section of the track ? Yes, General Admission areas around the track should be open. The organizers also promise access to the following grandstands: Main Grandstand, F, G, H, and I. Is it possible to arrive at any time during the day? It seems like all the tickets are sold out already. Are additional tickets for sale on day of the tests? hi. can I buy tickets at the gate?? Yes, you can. They cost 20 EUR. Only gates 1 and 3 are open. Hi…It’s possibile to move between the varius grandstand? for example: move from grandstand H to main or principale grandstand without leaving the turnstiles? Hi! Yes, you can actually walk right around the track after you have entered. There is also a useful underpass from grandstand K (near turn 1) over to the inside of the track near turn 6. Such a handy guide. I’m there this week. I’ll be getting the train from Barcelona to Montmelo and then walking from there. Do you think Gate 6 will not be open, meaning I should therefore head to Gate 3 instead? Correct Phil. Gate 6 will not be open (it wasn’t last week). Head to Gate 3 behind the Main grandstand and you’ll be able to get in there. Excellent, thanks. If I have anymore questions I’ll be sure to ask on here! do you know team line up for tomorrow testing ? or for all days ? What would je your best chance to get a driver signature/ selfie. I’m currently on the track and will also be next 2 days. Hi Cris, it will be difficult if you just have a regular ticket without pits/paddock access. The drivers come into the circuit through a special gate at the top of the circuit – between gate 1 and gate 7 – so not much chance there either. But you never know who you may run into if you just walk around. Also follow the circuit and teams on social media, as they may run competitions or offer the chance to meet the drivers. Good luck! Hi Andrew, thanks for all the info and great tips! Do you know when the guided tours tickets for the 2018 preseason testing will be available? Want to get them as Xmas gift but can’t find them anywhere yet… would they normally be available from the Barcelona Circuit website or is there any other reliable website selling them? Hi Natalie, the Barcelona circuit website will be the best place to buy the guided tours during F1 testing. I don’t know when the tickets go on sale, but will notify everyone on social media when they do. Buy quickly as they do sell out! Hiya, i was here last year with red bull. Cost me a fortune but was soo worth it, I noticed last year they were selling ( what i think was)paddock passes but since I already had one i did not ask for pricing. do you have any idea what that would cost? Or were they probably only selling the guided tours? I don’t think they were selling Paddock Passes. There is a guided tour of the circuit and paddock that costs 50 EUR > this is still not yet on sale for 2018. Also these tours sell out quickly. Follow us on social media and we’ll let you know when they are available. I can’t wait to return to Barcelona for testing; I’ve booked flights for the whole second week! Hi, i’m french and i’ll come to barcelona to see the pre season test on February 26 and 27. I’d like to book a special experience for theses 2 days and i need your help. I’d like to book tickets for these 2 days and if available with access to the paddock and track. whats the best : a pesos box access for one day and a free ticket at 18€ for the second one ? Hi Thibaud, the Pesos box is a great idea if you can afford it. Alternatively, I would buy the guided tour on one day for 50 EUR, which also includes general circuit access for that day. The tours are now on sale from the circuit and always sell out quickly. thanks for your help, thats the first time at the pre season test ! i’ld like to book a great experience. Do you know where is the nearest car parking ? Best parking is behind the main grandstand, near the main circuit entrance. It’s free and there’s plenty of spaces available. do you know this “Piso box” experience ? with tickets at 50€, i don’t know if we have access to grandstands…do you know if there is some food truck of anything else around the circuit with a basic ticket ? Hi Thibaud, I haven’t been in the Piso box myself, but it’s located above the pits, should be a great experience. There are a couple of places open to buy food and drink, but only behind main grandstand and up behind grandstand G. Personally, I will probably bring my own sandwich and just buy drinks. Really nice website and mini forum ! Do you know If the grandstands F G H I will be open on february for the pre season test ? Is there a parking outside the circuit ? I’be bought 18€ tickets but I don’t know how to proceed with my car ? Parking is free, but I am not sure all the carparks are open. I parked in the parking next to the main entrance last year (behind Main grandstand). There was plenty of free spaces. As for grandstands, it will probably be the same as last year: grandstands F, G, H & I were open, plus the General Admission areas and the members area inside turn 1. See you there! Is there any schedule for 26-27? We can join only for one day, and wanted to choose what teams to see on track. If there is a chance you know that. Or it doesn’t matter, every day all the teams will be on track? Hi Igor, all teams should be on the track every day, unless they have technical problems! Closer to the day, check “Circuit Cat” on social media to find out which driver from each team is in action on each day. Just wondering what transportation options there are for the winter testing. Are there still buses that run from Barcelona to the track, or is that only for the Spanish Grand Prix? Thanks! No dedicated buses to the circuit for winter testing. You’ll need to take the train to Montmelo, then walk to the circuit. hi…the 8 march i will come i barcelona to see the f1 test…but is it true that during the lunch break you can walk on the pitlane whit the general admission ticket? if you from where do you enter? After you have entered the circuit (paid 18 EUR for general admission) you can purchase a “special pass who will give you access to the terrace on the top of the garages building, the VIP Grandstand, the pit-lane walkabout from 13 to 14h and a 10-minute go-kart session in the go-kart track at the Circuit (next to the paddock).” This costs 30 EUR extra and can be bought from the information point at the Merchandising Area (behind the Main Grandstand). thank you very much for your reply and I have another question … if I purchase the special pass, how do I get to the terrace above the top of the garages building and to the VIP VIP Grandstand from the entrance 3 the one behind the main grandstand? I’m not 100% sure, but I think there is an underpass that goes below the circuit from near the back of the main grandstand. I’m sure they will tell you when you buy the tickets! I need to buy 11 tickets for Friday 9th, but the website only allows 5 at a time. Should I pre-buy the tickets? Or will it be OK to buy at the gate? Is there parking for motorhomes please? Also we will have a dog, can they enter with us on a lead? There is free parking; I assume you can park a motorhome, but you cannot stay overnight. I don’t see why you couldn’t bring a dog in on a leash – but best to contact the circuit to ask. Hi if I purchase the tour for €50 can you confirm if this year you can buy the special pass which includes pit lane walk and also can you confirm if you can pay to access the paddock as it’s sold out ? Hi Ryan, the 50 EUR ticket with guided tour is different to the 50 EUR ticket with go-karts, pit lane walk and access to the pit roof. As for the Paddock tickets for 100 EUR, depends which day you want to go – they are not sold out for all days online. If they are showing as sold out online, I don’t think you’ll be able to buy it at the circuit. Sorry. Hi, Is the Hospitality Acces tickets (Montjuic Club) significantly better than Paddock access? The price is more than double so wondering if it’s worth it?? It’s worth it only if you want food and drink all day. The views are not special, given Paddock tickets give you access to the Pit Roof and VIP Grandstand etc.